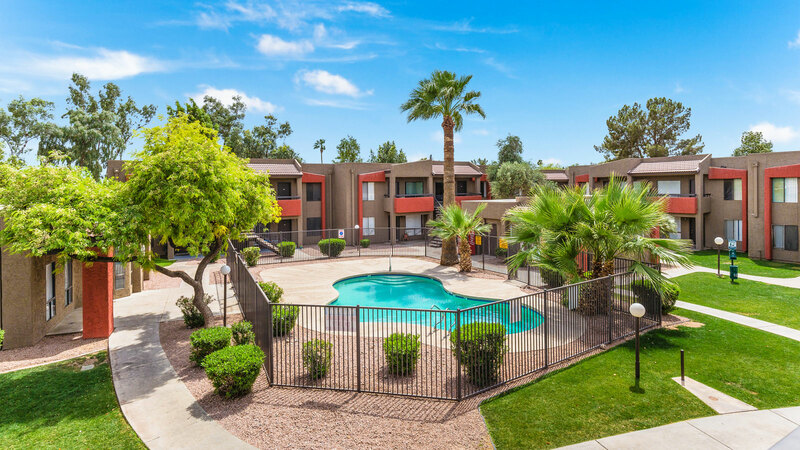 Phoenix, AZ – August 29, 2018 – ABI Multifamily, the leading multifamily brokerage and advisory services firm in the Western U.S., is pleased to announce the $22,350,000 / $80,978 per unit sale of Casa Bellisima Apartments located in Glendale, Arizona. Completed in two phases in 1983 and 1984, the property features a mix of studio, 1- and 2-bedroom unit types, with a weighted average unit size of approximately 648 square feet. Casa Bellisima sits on approximately 10.12 acres of land, with 18 building structures and a dedicated leasing center. Additional property features include a clubhouse, three swimming pools, three on-site laundry facilities, ample parking, a playground and BBQ grill areas. "The property is located in the South Glendale Submarket about one mile south of Downtown Glendale and a few miles east of the University of Phoenix Stadium and Westgate Entertainment District," states Alon Shnitzer, Senior Managing Partner, who was the lead broker representing both the buyer and seller in the transaction. "Unlike many, more interior, submarkets of the Phoenix MSA, with thousands of new units under construction, Glendale has witnessed very limited, extremely successful, new development towards its outer perimeters. As a result, many renters, priced out of more core, urban projects, have moved to these areas to find more affordable rent. Given the difference in price between highly renovated units versus new construction gives value add players such as the buyer, 3rd Avenue, tremendous upside potential in pushing rents." The buyer, 3rd Ave Investments, is a Phoenix-based real estate investment and management firm that specializes in the acquisition and re-positioning of Arizona multifamily assets. Since 2015, the company has acquired 14 properties and 2,600 units with an aggregate market value of more than $250 million. The team invests in innovative, profitable multifamily real estate for the benefit of its equity partners and residents. 3rd Ave investments plans to maximize value and improve rents at Casa Bellisima with a thoughtful redesign and repositioning strategy. The seller was a joint venture between Beverly Hills, California based EBEX Holdings and Miami, Florida based Monument Capital Management. Monument Capital Management ("MCM", or the "Sponsor") acquires controlling interests in multifamily apartment buildings primarily from the Mid-Atlantic region through Florida, the Gulf Coast and Texas. As the Managing Member of Monument Multifamily Investors, MCM directed the acquisition activities of a $20 million joint venture that purchased multifamily properties valued at over $80 million. MCM is unique in they are a fully integrated real estate investment group that identifies attractive acquisition assets, structures and closes the deals, manages the properties and, where needed, repositions the assets using an affiliated construction company. The multifamily brokerage team of Alon Shnitzer, John Kobierowski, Rue Bax, Eddie Chang and Doug Lazovick represented both the buyer and seller in this transaction. ABI Multifamily is a brokerage and advisory services firm that focuses exclusively on apartment investment transactions. With offices in Phoenix, Tucson, Sacramento and San Diego, the experienced advisors at ABI Multifamily have completed billions of dollars in sales and thousands of individual multifamily transactions. ABI Multifamily incorporates a global approach with regional real estate expertise to successfully complete any multifamily transaction, regardless of size and complexity.